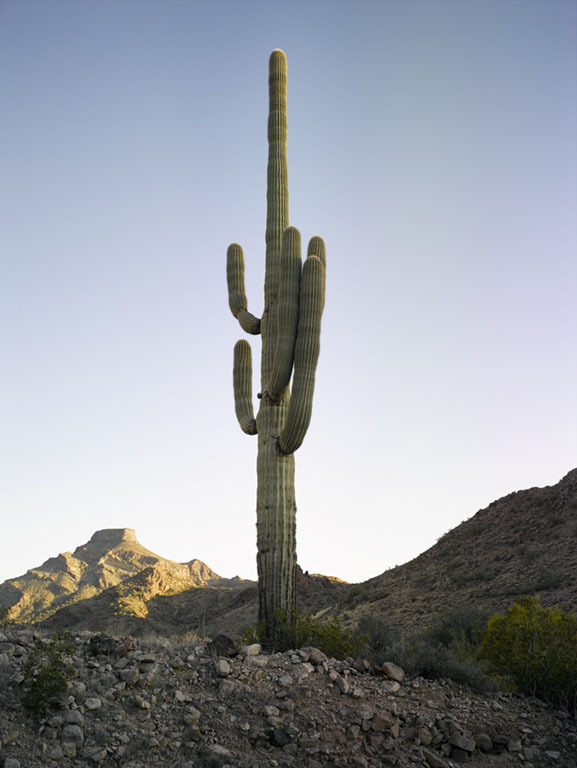 The photographs of Mark Klett are consummate depictions of the untamable, immeasurable Western horizon as it intersects with our human experience of light, landscapes, and time. 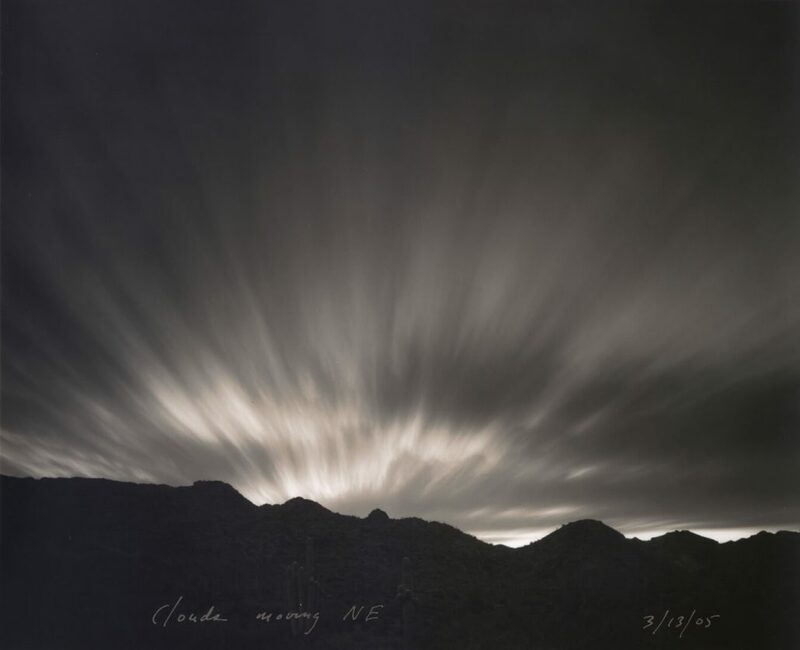 For nearly four decades Klett has documented the demanding environments and idiosyncrasies of life in the Southwest. 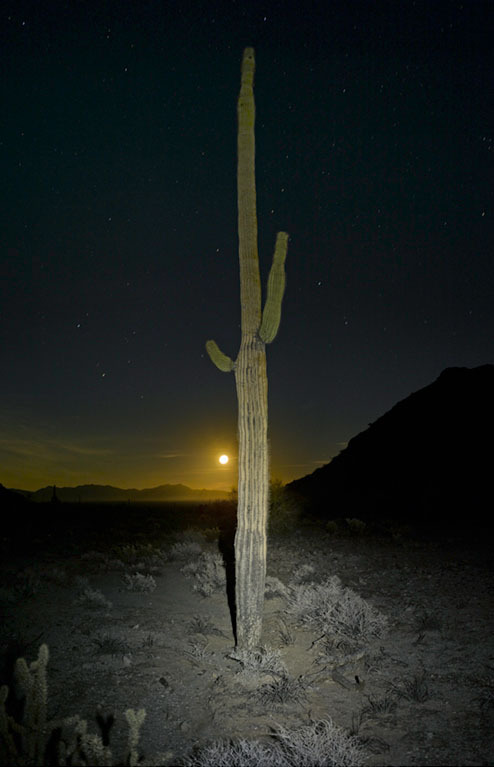 In his latest exhibition at Lisa Sette Gallery, Klett showcases his mastery of the medium in his new color “Saguaros” imagery, a series related to his “Desert Citizen” black and white photographs originally conceived as saguaro portraits. Although the saguaro is seen as an emblem for the Southwest, it is truly a unique species confined to the Sonoran Desert in Arizona, Sonora, Mexico, and part of California. 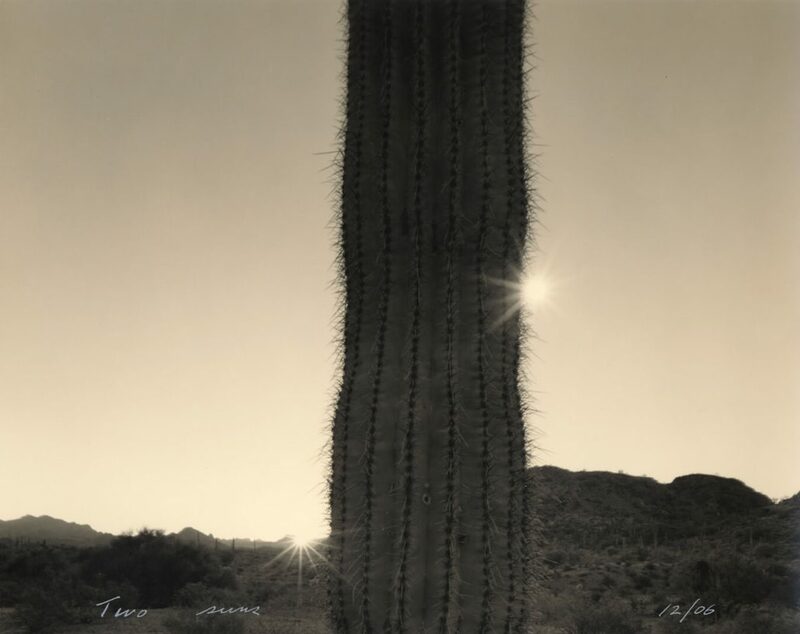 The hardy saguaro soaks up water and stores it to consume slowly, especially in times of drought – with a sense of survival and human-like ingenuity engrained within its spines. Klett began making these sticks in the late 1990s and has made them on almost every trip to the present. The early sticks used in the game were discarded. But over time he began to carve them by the light of the campfire and adorn them with objects found during the day. Each stick represents a unique location and experience. Almost all the sticks make some kind of reference to the history of the land visited and the stories of the journey. Klett has received fellowships from the Guggenheim Foundation, the National Endowment for the Arts, the Buhl Foundation, and the Japan/US Friendship Commission. 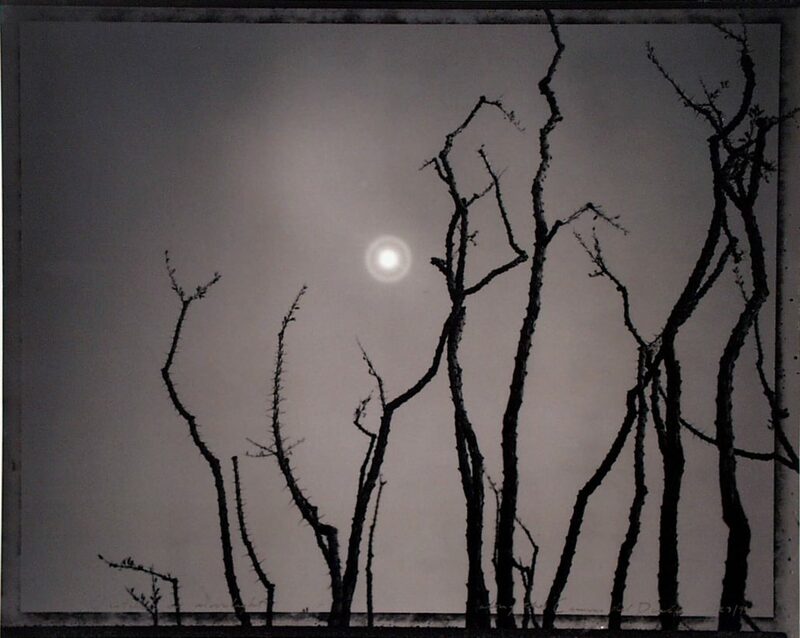 His work has been exhibited and published in the United States and internationally for over thirty-five years, and his work is held in over eighty museum collections worldwide such as the Amon Carter Museum, Fort Worth; the Art Institute of Chicago; the Center for Creative Photography, Tucson; the International Center of Photography, New York; the J. Paul Getty Museum, Los Angeles; the Museum of Fine Arts, Houston; The Museum of Modern Art, New York; the Tokyo Metropolitan Museum of Photography; the Victoria and Albert Museum, London; Stedelijk Museum, Amsterdam, and the Whitney Museum of American Art, New York, among others. 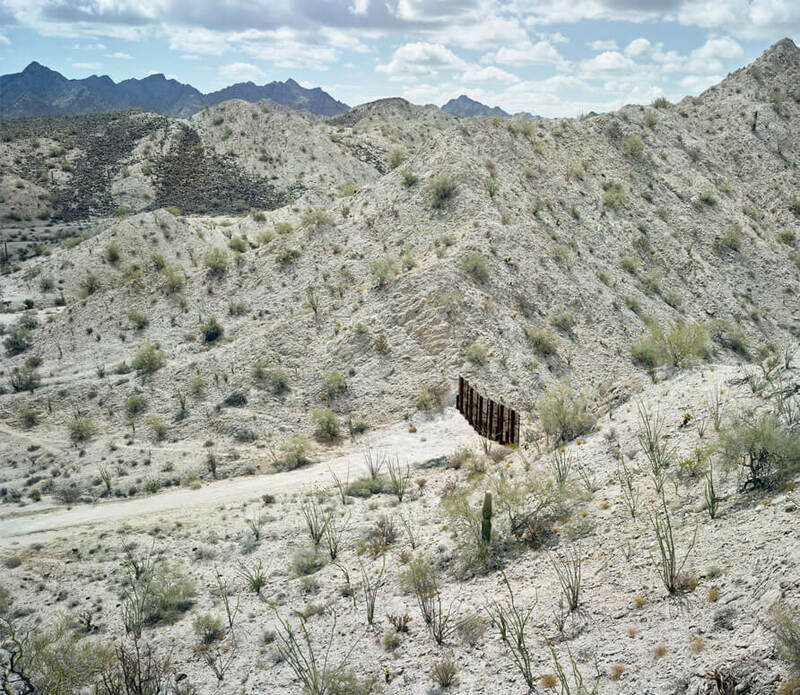 He is the author/co-author of fifteen books including Camino del Diablo (Radius Books 2016), Reconstructing the View: the Grand Canyon Photographs of Mark Klett and Byron Wolfe (University of California Press 2012), The Half Life of History, and Saguaros (Radius Press 2011 and 2007), After the Ruins (University of California Press 2006), Yosemite in Time (Trinity University Press, 2005), Third Views, Second Sights (Museum of New Mexico Press 2004), Revealing Territory (University of New Mexico Press, 1990), and Second View, the Rephotographic Survey Project (University of New Mexico Press, 1984). Klett lives in Tempe, Arizona where he is Regents’ Professor of Art at Arizona State University.